make it possible to visually explore various locations by aggregating and displaying photos from around the web. Today, we’re offering you a better, more streamlined way to view these photos. With this new feature, you can easily flip through a whole collection of photos and find the sites on the web that have relevant pictures of a given place. 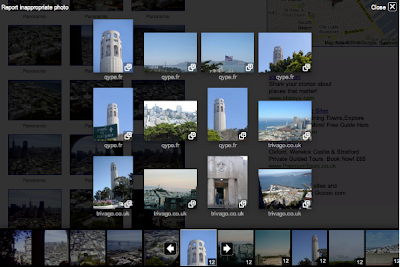 Photos that have been uploaded by our Panoramio or Google Places users will appear in high-resolution as an overlay when users click on them. For photos from other sources, you can easily click on a specific photo to see more and visit the site it comes from. This simple and intuitive online album experience makes it easier to explore all the wonderful photographs of places all over the world. 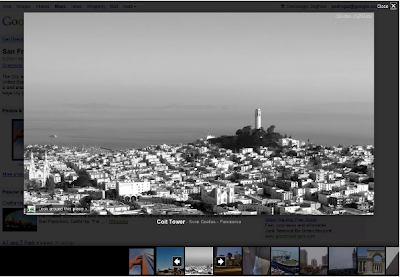 For example, the above photos on the Place page for Coit Tower in San Francisco really help bring the place to life since they’re shot from multiple angles and different times of day, and provide context about this landmark’s location in San Francisco. If you’re interested in uploading your photos of places and making them more discoverable online, check out Panoramio, a great way to share geo-tagged photos on the Web. When you’re curious about a new place - be it a restaurant that you haven’t yet tried or a popular tourist attraction you’re considering visiting on an upcoming trip - you may find it useful to see what that place looks like in advance. For this reason, Place pages make it possible to visually explore various locations by aggregating and displaying photos from around the web.